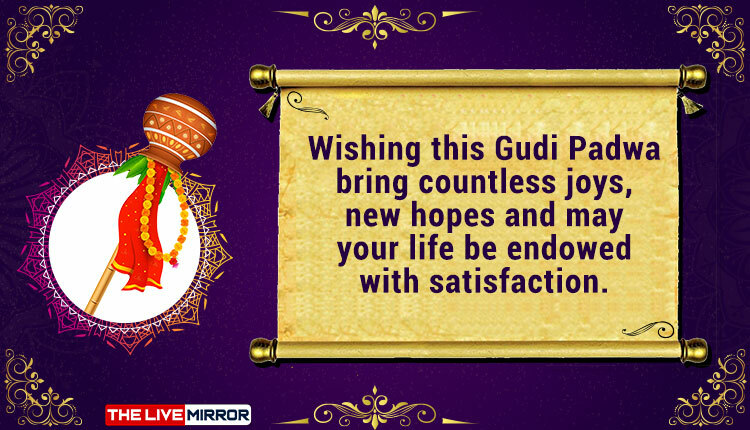 Gudi Padwa 2019 Images: Here is everything from WhatsApp Messages, Greetings, GIF Images and Wishes for the Marathi New Year 2019. After Holi, we are just a few hours away to celebrate yet another festival Gudi Padwa 2019, which marks the traditional new year for Marathi Hindus. Yes, Gudi Padwa is basically celebrated by people living in Maharashtra or near Maharashtra on the first day of Chaitra month. The festival is celebrated with colourful floor decorations, street processions and festive foods. It will be observed on April 6 this year. On the occasion of Gudi Padwa , you will see Maharashtrian family come together welcoming the New Year Day. One of the key element of this festival is the hoisting of a colourful silk banner on bamboo and topped with an upturned drinking pot. It is then decorated with a garland of flowers and mango leaves. Since Gudi Padwa 2019 will be celebrated tomorrow on April 6. 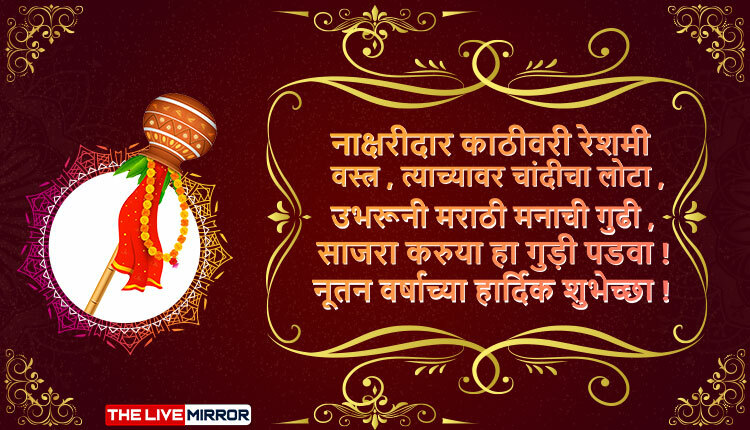 We have brought you Gudi Padwa greetings, Gudi Padaw GIF messages, Gudi Padwa wishes in Marathi, Gudi Padwa Images, Gudi Padwa WhatsApp and social media messages to make 2019 Marathi New Year more wonderful. May the flavour of raw mangoes, raw neem, and jaggery remove all bitterness and add sweet flavours to your life. Wishing this Gudi Padwa bring countless joys, new hopes and may your life be endowed with satisfaction. Wishing you love of love on the auspicious occasion of Gudi Padwa. Have lots of fun with your family and friends. May the festival of lights be the harbinger of joy and prosperity. As the holy occasion of Gudi Padwa is here and the atmosphere is filled with the spirit of mirth and love, here’s hoping this festival of beauty. This Gudi Padwa may you be blessed with good fortune as long as Ganeshji’s trunk wealth and prosperity as big as his stomach happiness as sweet as his ladoos and may your trouble be as small as his mouse. Happy Gudi Padwa. नाक्षरीदार काठीवरी रेशमी वस्त्र , त्याच्यावर चांदीचा लोटा , उभरूनी मराठी मनाची गुढी , साजरा करुया हा गुड़ी पडवा ! नूतन वर्षाच्या हार्दिक शुभेच्छा ! हेप्पी गुढी पाडवा. स्ने्हाने साजरा, करा पाडव्याचा सण. Suru Hot Aahe Navin Varsh, Manat Asudya Nehami Harsh. Yenara Navin Divas Karel Navya Vicharana Sparsh. aisa aye apke liye Gudi Padva ka tyohar! Sajra karuya ha Gudi Padwa! Sukh samruddhiche, padata dwari paaul Gudhiche…. Making Gudi Padwa 2019 more memorable, share these Gudi Padwa advance greetings 2019 with family members, friends and wish them a healthy and prosperous Marathi New Year. We Wish You A Very Happy Gudi Padwa To All…. © 2019 - The Live Mirror. All Rights Reserved.